So, I mentioned the other day how I had turned myself in to the organization police in the form of my friend Melanie, who tackles such projects like they're second nature to her. Shamefully jam-packed spare room crammed completely full. There's not even a path through the chaos. Don't mind the giant baby crib full of vintage clothing and whatnot. That one part is a job for a whole other day. Everything's sorted and stored, there's room to walk around (a bit), and the you can get to it all! Fancy, fancy china! Cups and berry bowls pictured. It's labelled Meito Norleans China, Fairfield, Made in Occupied Japan. It's so delicate I'm afraid it will dissolve in my hands, and it's beautiful. Way too beautiful to be in my possession - I'm a danger to myself and my things, as you saw in the before picture up top. And yet I didn't break any of it! If the Internets are to be believed, it's pretty darn rare, this china. Currently there's not a single piece of it on Etsy, or Ebay, or Ruby Lane, or anywhere else I could find except for Replacements.com, and even they can only offer you 2 imperfect cups and saucers (I have over 60 pieces!). Beyond that all they offer is the information that the pattern was discontinued circa 1950, and since it's marked 'Made in Occupied Japan', I think that narrows this down to the second half of the 1940s. It's so, so beautiful you guys! I'm scared to take it to my booth. Scared I'll break it along the way, scared it will make everything else I sell look crummy by comparison, and/or scared I won't be able to sell it for anywhere near what it's worth because the rest of my stuff is nifty, but far less rare and special. I'm taking advice on the situation! 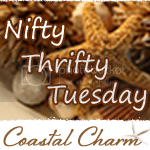 Cap Creations Thrifty Love Link Party, Beez Rental Designs' Frugal Treasures Tuesday, Coastal Charm's Nifty Thrifty Tuesdays - My entry into Nifty Thrifty Tuesday Party is sponsored by Appliances Online and the Best Range Cooker. - and Me and My Shadow's Magpie Mondays. Oh my goodness! Fancy coming round to sort my attic/garage/shed?! Oh yeah, way to go with the organizing jag! That's how it happens for me too, I finally get a hair up my bum about getting a particular room in order and then do it all at once! Love, love, love the china set. I have a thing for dish sets and I definitely would have snatched that set up if I had seen it. I just found you through Beez Rental Designs. I'm your latest follower and a fellow newbie. 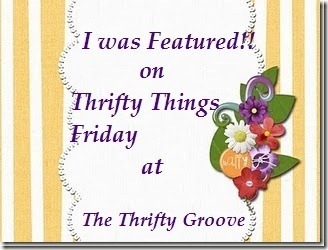 I hope you'll stop by and check me out at www.crazythriftycrafts.blogspot.com. Thanks for sharing! Oh awesome, welcome! I'll definitely come check out your site! I say get it to the booth! Do you have a case in your booth to keep all the butter fingers from accidentally dropping it? It is beautiful, but unless you'll be displaying it in your own home, it's not fair to keep it from being enjoyed by somebody else. Ah, the guilt of loving vintage...the intense need to "save" everything from inevitable doom. Oh when you put it that way, you're so right. But no, I don't have a display case in my booth. I think, though, for a higher commission I might be able to put them in one of the antique mall's display cases. I'll have to look into that. Hey there, thanks for joining us at Cap Creations. I've featured you at the blog today! Oh wow, thanks! And thanks for hosting. I'm linking up again this time. Such fun to see what everyone posts! Yes, I thrifted. And I can't even regret it.